where people still embody this reality, connecting and living in harmony with everything that enriches life to make it meaningful and magical. Pacific Ocean it is home to 26 different indigenous cultures, and well over 200 distinct nations. main languages spoken however there are over ten native languages still spoken - Achuar-Shiwiar, Cha'palaachi, Cofán, Tsachila, Cuaiquer, Secoya, Shuar, Siona, Tetete, & Waorani. 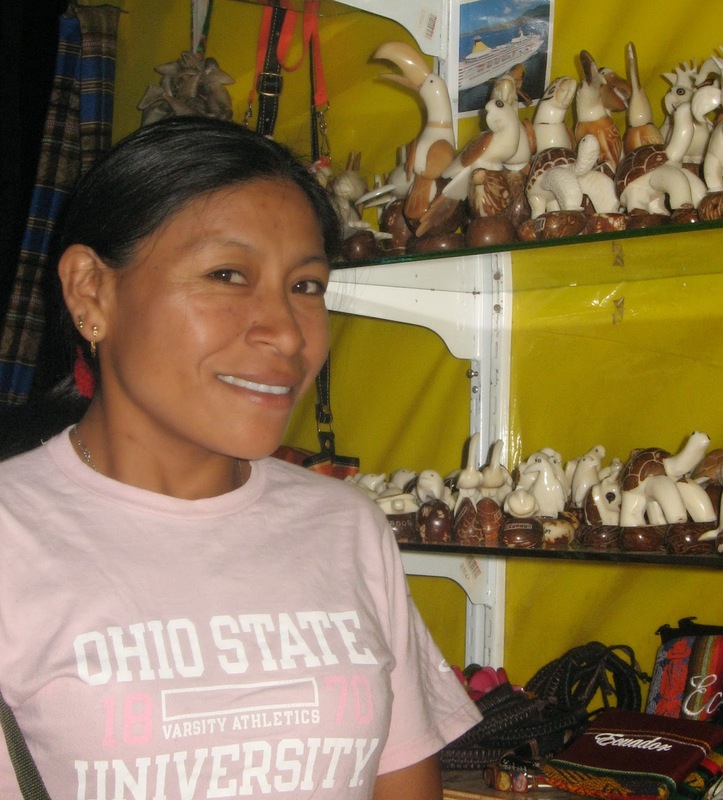 years living here prior to the arrival of the Europeans, and this rich diversity of multi-ethnic indigenous cultures in Ecuador is at risk for disappearing. together to harvest crops or build roads, community infrastructure, and homes. prosperity, it threatened minority groups and their homelands. medical facilities, power systems, highway networks, and canals. nationalities and continues to threaten indigenous peoples. collective territory, the use of natural resources, cultural patrimony, and bilingual education. Afro-Ecuadorian and the majority white/mestizo population, continues to be significant. hygiene, education, and preserving traditions and culture. areas inhabited by indigenous groups. like the Tagaeri & Taromenani, who had been isolated from the outside world until recently. raise 350 million dollars per year, approximately 50 percent of what the state would earn from extracting the petroleum. Unfortunately the idea did not receive the necessary support. classrooms, sports courts and offers early education to high school. reference to the fact that these schools are financed by 12% of the oil surplus. with sights, vibrant colours, smells, flavours, and sounds often never experienced before. diversity of our local people. for the domestication of squash. quinoa, peppers, & peanuts. Animal husbandry domesticated the llama, alpaca, guinea pig, and muscovy duck. An island in the estuary of the Santiago River home for Las Tolita, artisans that made alloys of platinum and gold creating the material into miniatures and masks. The Jama-Coaque, Bahía, Guangala, and Jambalí also practiced metalwork in other areas of the Ecuadorian coast. Trade networks were established and different styles of pottery made. Metallurgy, weaving, and ceramics refined, agriculture intensified, and urban centres developed. tribal communities and diverse social, cultural, and economic systems. The ethnic groups of the central Sierra were generally more advanced in organizing farming and commercial activities for efficiency and specialization. Year long harvests of a wide variety of crops provided economic success. 12.5 million - the largest indigenous population in the world. and harvesting multiple cycles of crops. The condor is considered sacred representing the god of peace, and the eagle the god of strength. Shamanism is practiced diagnosing and treating illness with rituals and natural plant medicines. In June, all highland Quechua communities celebrate Inti Raymi - a harvest festival of the sun. A traditional sun dance where the dancers move in a rainbow pattern, wearing wool masks and feather crowns. The feathers are from the extinct pacharaco bird. The community spectators are costumed representing anything from wolves, to brides, to shamans. 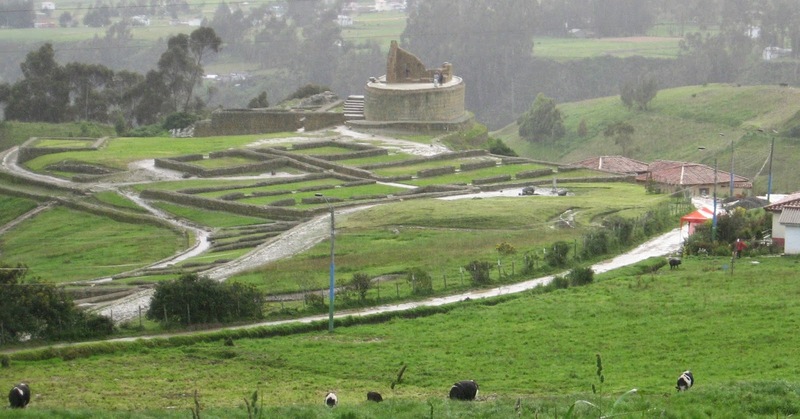 Azuay near Cuenca, were the most advanced, and most feared by the Inca, due to their fierce resistance to the Incan expansion. Cañari used a lunar calendar and built temples in circular or moon-like shapes. Cañari construction rivaled the Incan capital, Cuzco. The Cañari held the snake and the macaw sacred believing they were their ancestors. their economic survival in the 1950's. 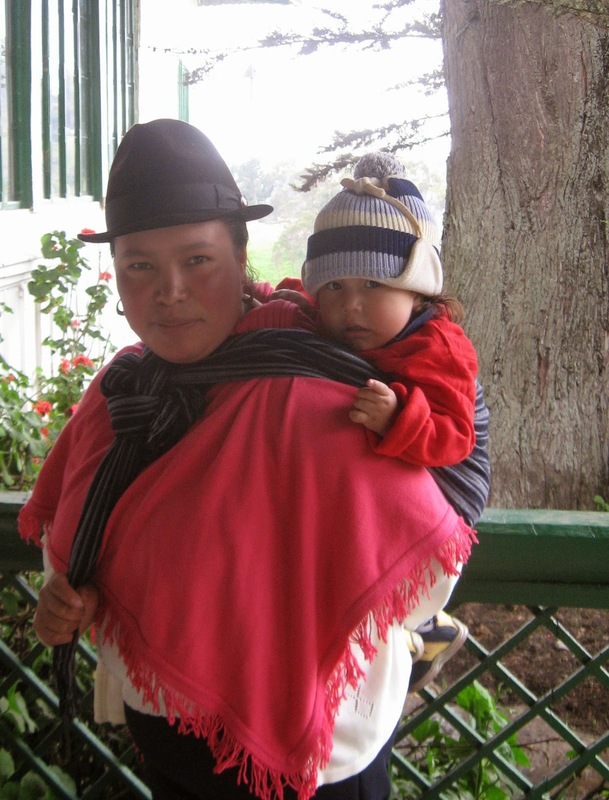 Descendants of the Cara Indians from over 500 years ago, Quichua is their native language. their traditional pan flute music and crafts. instruments. They are easily identified by their traditional dress. For men a blue poncho, white pants, long braided hair ( shimba ) topped with a black felt fedora. traditions. They are very proud people and it shows. Chimborazo has the most Indigenous people numbering 250,000 representing approximately 40% of the province's population. Known as the most rebellious highland tribes Cachas, Lictos, Coltas, Calpis, Pulucates they have very distinctive dress. Salasaca, a community located centrally in the Tungurahua Province halfway between Ambato and Baños. The Salasacan people number about 12,000 and speak Quichua & Spanish. They are known for rebellious social behaviour. The area has a unique small black cherry - Capuli. Their main economic activities are agriculture, raising livestock, and handwoven tapestries made on ancient looms. A loom can be found in mosthomes where sheep's wool is washed and coloured with vegetable dyes for weaving. handbags, hats, & tapestries may be found in the central plaza market "Plaza of the Arts". ribbon. Their traditional house has walls made of mud and bamboo, no windows, one door, and a straw roof. The bed, sleeps the entire family , is made of bamboo. collective rights and land use. bead necklaces for women, for both hair is worn in a long ponytail. consumer society owning vehicles, computers, televisions, stereo systems, cameras etc. The Amazon rainforest, rich in flora and fauna, has areas which are protected: Yasuni National Park, Cuyabeno Wildlife Reserve, Huaorano Protectorate, Sumaco Napo-Galeras National Park, Limoncocha Biological Reserve, & Sangay National Park. The Amazon holds 3 of Ecuador's most important rivers: Putumayo, Napo and Pastaza. 40 % of the earth's fresh water flows through the Amazon basin winding its way thousands of miles through the rainforest. In the Amazon river there are islands as large as Switzerland, and many points where you will see neither shore from the middle. Inside the rainforest dugout canoes use the rivers for travel and transport to riverbank settlements. 600,000 Indigenous inhabitants are scattered throughout the rainforest with silviculture as their primary economy. Over 200 distinct nations most notable are the Achuar or Shiwiar, Cofán, the Huaorani, Oriente Quichua (the Canelo and the Quijos), the Shuar, the Siona-Secoya, and the Zaparo. These tribes are the guardians of the world's biological heritage - having lived there for more than 10,000 years, they know its trees, animals and rhythms. Many live in voluntary isolation in this remote amazon rainforest. This garden of eden is home to some of our favorite foods: avocado, black pepper, Brazilian nuts, cayenne pepper, cashews, cocoa, cinnamon, eggplant, figs,ginger,sugarcane, vanilla and yams. They extract dyes from the achiote plant for face paint, and curare poisons for blowgun darts from various other plants. Shamans diagnose and treat illness with rituals and plant medicines. Access to the jungle is obtained by road from Quito to Coca, Baños to Puyo, or Cuenca to Macas. About 5,000 Achuar or Shiwiar Indians live in huts above the riverbanks in the southern Amazon rainforest in the province of Morona Santiago bordering Peru. They speak Achuar, a Jivaroan language. The Achuar are related to the Shuar. They share the same area, many of the same customs, traditions and also speak a similar language. Life centers on the domestic household with hunting, fishing, and gardening pursuits. Women give birth to their children in the sanctity of their gardens. The men hunt with 8 ft long blowguns and " pencil lead " thin darts. Fishing may be done with a hook and line or with a wicker basket filled with crushed barbasco vines which weaken the fish. Their huts are 25 ft high oval structures, open on the sides, with palm leaf roofs, dirt floors, and a bench around the circumference. Cooking is done on an open fire, and sleeping in a small enclosed area. Daily each morning the entire family gathers to tell stories. These stories serve as guidance for the children and to preserve their people's history. Their economic security is currently provided by tourism where they opened Kapawi Lodge & Reserve hosting about 1,000 visitors annually. United Nations has declared it one of the top five environmental conservation and community development projects in the world. Currently embroiled in a struggle to protect their resources in which native people have almost always lost. The government has ordered the breakup of a group named Fundacion Pachamama supposedly in an attempt to stifle dissent and quiet those that speak for the Achuar. The Cofán number 2,100 and are the oldest surviving indigenous culture in the Sucumbios Province - northeast Amazon. 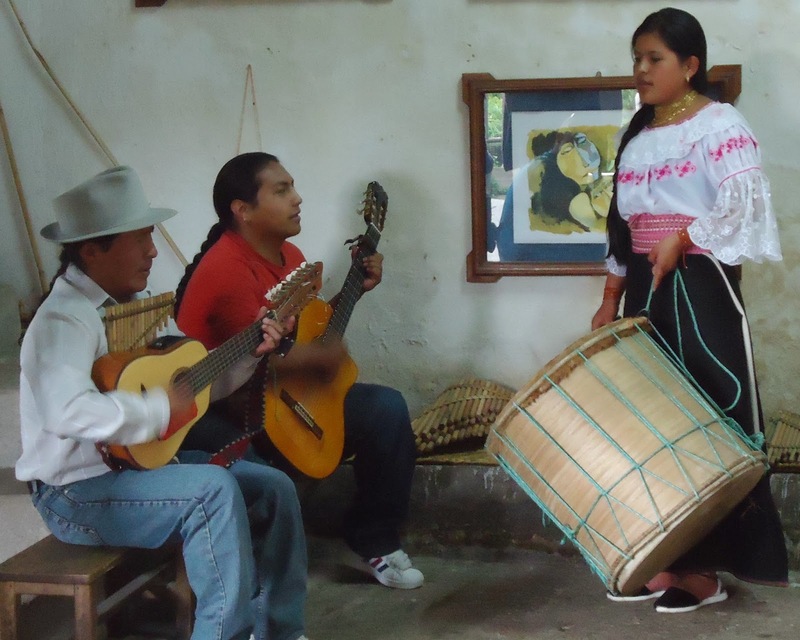 Their communities are along the banks of the Bermejo River in the Cayambe-Coca Reservation. There is no road access to their settlements rather they use canoes and travel the river. Their language is A'lngae. They are known for their piercings in their noses and ears for displaying feathers, and flowers. Currently they are working to bring back traditional animals to their region by raising turtles and caimans for release into the river. Pink dolphins, tapir, and several monkeys which are endangered in other regions have healthy populations there. Approximately 2,500 Huaorani, known as one of the most violent cultures (warring savages),territory extends from the Napo river in the north, to the Curaray river in the south. They have an extensive botanical knowledge of complex plants and trees for their medicines,poisons, and hallucinogens. In fact the symbiotic relationship with the rainforest transcended into the spiritual practice of Shamanism. They have a spiritual belief that after death one walks a forested trail to the afterlife. On that trail a large anaconda lies waiting. Those unable to escape the snake fail to enter the spiritual domain and return to the earth as termites. Blowguns with poison tipped arrows, and spears are the main weapons for hunting and fishing. When hunting for their food they held deer, snakes, and the jaguar as sacred. The Huaorani people and crude oil were both discovered at the same time in the Amazon Basin. The western world was most interested, but of course there was no commonality between the interested groups. In 1990 the Huaorani won rights to a land reserve within Yasuni National Park. Speaking the language of Wao Tiriro, they remain the most isolated from civilization, hostile to outside intrusions and willing to resort to violence to defend their territory. Threatened by oil exploration and illegal deforestation practices they continue to reject outside contact and move deeper into isolated areas. The Tagaeri and Taromenane tribes continue to live entirely off the land without external contact to this day. As isolated indigenous groups throughout the world continue to be assimilated into surrounding cultures, hopefully we can learn from the Huaorani experiences and avoid repeating the mistakes made. A new television series "Surviving the Tribe", produced by National Geographic, filmed one of its episodes with the Huaorani indigenous community in the Ecuadorian Amazon. Hazen Audel learns about daily life in the jungle- walking and climbing trees barefoot, making fires, building a blowgun to hunt monkeys, mounting piranha teeth on the tips of darts and coating them with curare, the neurotoxic venom that paralyzes. It shows us that sometimes the most important things in life are the simple things. The Amazonian Quichuas' population is between 30,000 and 40,000, whom are divided into two subgroups: Napu Quichuas Runa of the Upper Napo river and the Canelos Quichuas, located in the province of Pastaza. 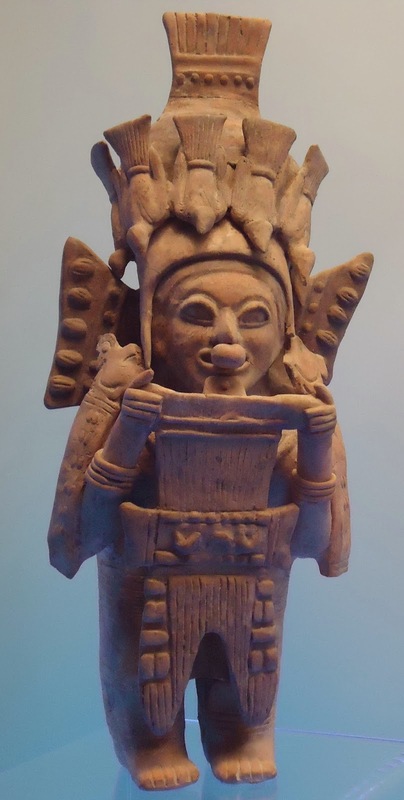 They speak the Quichua language which was found in the Amazonregion before the conquest as a trade language and introduced from the Andean mountains in the seventeenth century by Catholic missionaries. The Shuar, the second largest, and most studied Amazonian group are famous as fierce warriors, headhunters, head-shrinkers, and for being practicing Shamans. Shamanic practices are natural cures for human ailments, curses to cause enemies ailments or accidents, and to remedy problems caused by enemy shamanic practices. Hallucinogens of various kinds were used by Shuar shamans. Shuar homes known as "jivarías" were single room structures - divided for men's and women's spaces, oval in shape, with thatched roofs and chonta-pole walls. Traditionally they were isolated in small clusters of 2 or 3 along riverbanks and only accessible by canoe. Once food resources were depleted in the area they would move to a new location. As horticulturalists they would clear the jungle vegetation and plant gardens of manioc. Manioc is both eaten and fermented into an alcoholic drink known as chicha. As they raised few animals, hunting small animals with blowguns and poison darts and fishing were their major food sources. The Sionas and Secoyas are located in the northeastern part of the Amazon, in settlements along the banks of the Aguarico river. Their language is Tucano with historic and linguistic connections to Colombian Indigenous groups. Originally they were two separate ethnic groups with similar cultures and languages that were merged due to intermarriage. Men hunt, fish, make houses & canoes, clear gardens, wood carving, hammocks, and featherwork. Women cook, raise the children, plant & tend the gardens, make clothes, bags, pots, and ceramics. Their territory was devastated by oil exploration and they fought back by suing Texaco for more than one billion dollars for a variety of environmental abuses, including dumping more than three thousand gallons of oil a day into their lagoons. Ramón Piaguaje is the most famous Secoya with his painting "Eternal Amazon." It was selected from over 22,000 entries by professional artists from 51 countries as the winner of the first prize of the United Nations Millennium Art Exhibition in aid of UNICEF - "Our World in the Year 2000." The Siona people are a very small indigenous group of about 200 live in the Cuyabeno Wildlife Reserve in Sucumbios province. They share territory with the Secoya, and speak Tucano. Besides some traditional activities for subsistence, they now have tourism activities. This sector has generated various sociocultural and economic changes such as immigration to neighboring cities, gender issues, and economic dependency on tourism revenues. 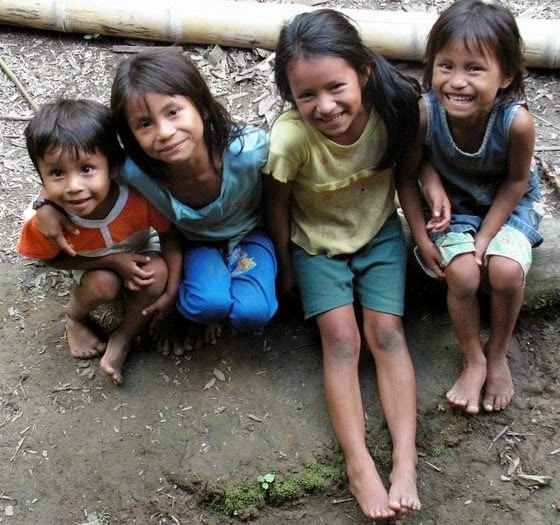 The smallest indigenous group, nearly extinct, having their home in the amazon jungle area near Peru. Their history is an example of the devastating impact of Western civilization as their population fell from 200,000 to a few dozen. Palm hearts were their main vegetable and they fished the rivers and used blowguns to hunt small animals for food. They believed spider monkeys to be their ancestors and therefore sacred. Zaparo is the language spoken. fishermen, but also practiced agriculture and trade, with each other and the tribes in the Sierra. The most important commodity they provided were Spondylus shells, which was a symbol of fertility. The Awá or Coaiquer are an ancient indigenous people that are found in the northern province of Carchi, Imbabura & Esmeraldas. The population of several thousand speaks the language Awapits. Their Reserve was established in 1987 but unfortunately illegal logging and mining activities continue. The Awá traditionally hunt, gather, fish, and cultivate plants. Today they also have livestock, such as pigs, chickens, ducks, & guinea pigs. hot peppers, chirimoya, tomato, tamarindo, mango, achiote, borojo, naranjilla, papaya, inga, avocado, and peach palm. their lives, which would be contrary to their supernatural beliefs. Forces of Colombia (FARC) and the Colombian army. with the Afro-Ecuadorians who occupy the same region. Their language is Chapalachi. engage in agriculture for domestic consumption and grow coffee and cacao for export. parrots, and hummingbirds. The Chocó forest also supports a coastal mangrove system. 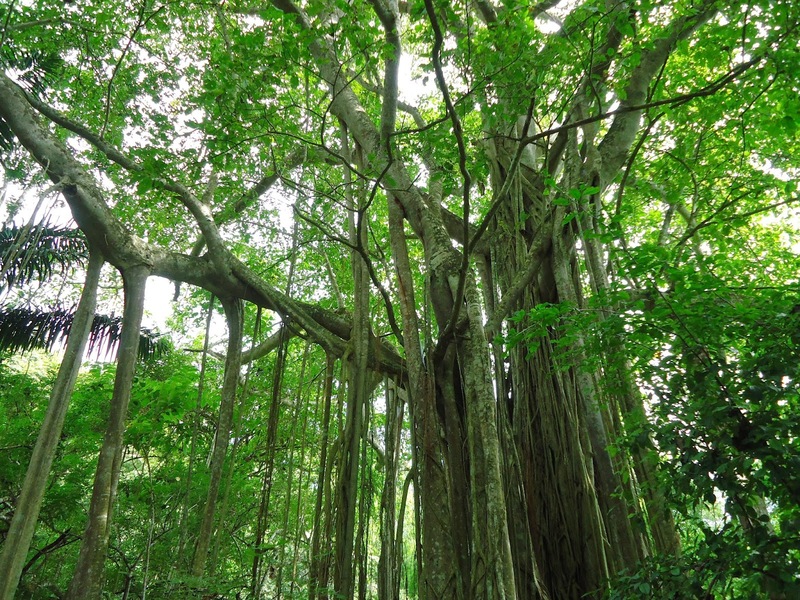 means that crops grow in the rainforest, instead of cutting down the trees to make room for their crops. been forever grateful and continue to use the plant for disease protection. women brightly colored horizontally striped skirts. for their conquest of Ecuador from the Incas. The ship headed for Peru was stranded off the Ecuadorian coast allowing their escape. Currently there are over 1.1 million Afro-Ecuadorians located mainly on the northwest coast in the province of Esmeraldas and the Valley of Chota in Imbabura. They represent about 5 % of the country's population. and drums, and bomba played with guitars and bongo drums. One of the most famous Afro-Ecuadorians currently is Ecuador's national soccer team's captain Antonio Valencia who also plays for Manchester United. history of the Indians of Ecuador. An anthropology book on the Jibaras. the Quechua and other tribes in this region.